Hi, All ! 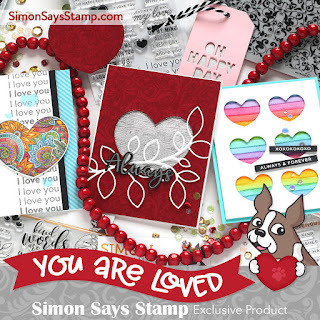 Welcome to Day 1 of Blog Hop for Simon Says Stamp's You Are Loved Collection. I'm so honored to be part of the blog hop, today. If you have come here from talented Heather's Blog, then you are on the right path. Or, you can start your hops from Simon Says Stamp Blog. Today, I'm going to share 3 sets of cards featuring You Are Loved. Here's the first set. I started by stamping Quilted Hearts on Cotton Candy Card Stock using Embossing ink, then I heat embossed it using White Embossing Powder Fine Detail. I then trimmed the panel into A2 size, cut out a heart shape window in the center using Ornate Love Dies. 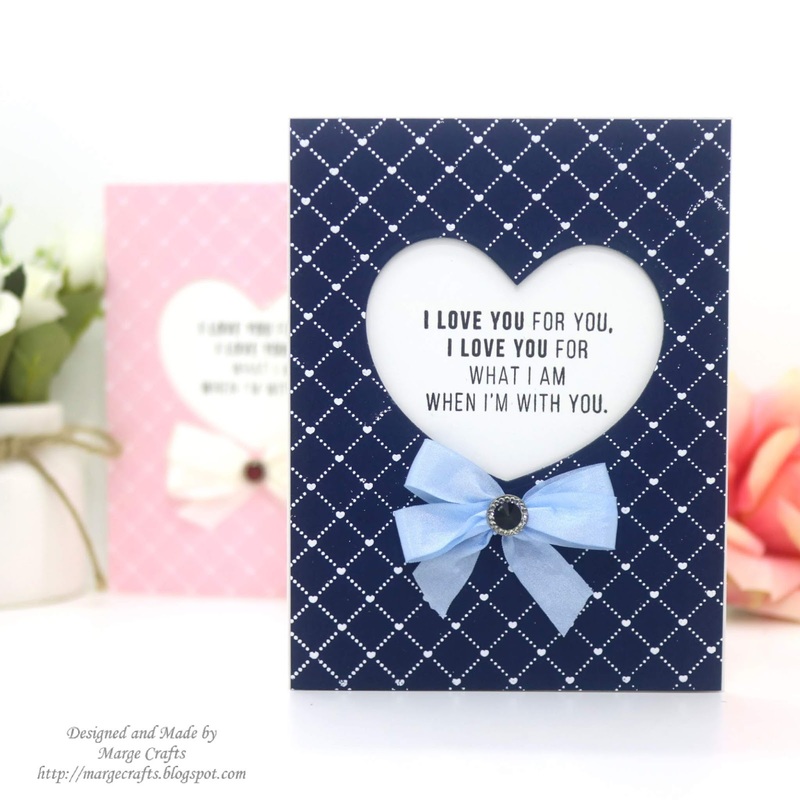 Next, I made a card base using 110 Neenah White, placed it onto my MISTI, then I stamped Love Messages making sure that the sentimens would be placed exactly within the heart window. I used previous heart panel as a guiding tool to place sentiments. In turn, I foam mounted Quilted Hearts panel onto the card base, and embellished my card using ribbon and gemstone. I made a twin card with same design but different color scheme, for which I used Neenah Texture Navy Card stock instead of pink paper. Here's the second set which features Moments of Grace set. I love those heartwarming and encourating words included in this stamp set. I used Beautiful Flowers to make watercolored panel and I colored the images using Watercolor Brush Markers. Then I added splatters of White Acrylic ink over the colored images. I stamped sentimets from Moments of Grace set using Versafine Onyx Black Ink. Then I foam mounted panels to A2-card base and finished off my cards by adhering Sparkling Clear Sequins Mix and Ballerina Pink Sequins. Today's last set features Windows To My Heart Dies set. As a huge fan of shaker cards, I couldn't resist to make them at the first moment I saw thus set. For this white card, I used rainbow gradiation of Jewels ( Blush, WaterMelon, Lemon Drop, Aquamarine, Spring Green, and Pansy Purple). For coral one, I gave color gradiation from clear to light pink/gold and deep pink/red. I put 3mm Sparkling Clear Sequins, Clear Seed Beads, Gold Shimmer Beads, Ballerina Pink and Raspberry sequins into the shakers. Sentiment from Love Messages was heat embossed in white on Schoolhouse Red Cardstock using White Embossing Powder Fine Detail. That's it from me for today. Thank you so much for your visiting and reading my post. Now your next stop to hop along is super talented Anna Kossakovskaya's blog. Here's also the full list of Day 1 Blog Hop. Please be sure to visit all to get lots of new inspiration from desginers. 1. Use the code LVE584 for a free Tim Holtz Festive Berries Distress Oxide Ink Pad (while supplies last!) with any purchase. The code will expire Sunday, 1/13 at 11:59 pm EST. 3. 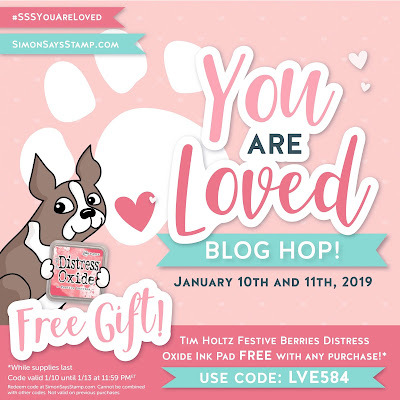 Simon Says Stamp is giving away a $25 coupon to every stop on the hop from blog comment section. Winners will be posted on the Simon Says Stamp store blog on Wednesday, the 16th of January. Please visit Simon Says Stamp You Are Loved Gallery for more inspiration and share your creations there, too. You are so incredibly talented; I love what you create. SQUEAL!! LOVE these!! Just BEAUTIFUL!! THANKS for sharing all of the AMAZING Inspiration and for the chance to WIN!! Have a FABULOUS Week!! Oh I just love all of the beautiful card examples you’ve shown us!! They are all so unique and I love the wide variety of styles. I especially love your coloring on those flowers!! Fantastic cards. Your colouring skills are outstanding. Cheers. Wow, you are amazing!! Your cards are awesome. Your coloring is just fantastic!! Thank you for sharing your talents with us!! Wonderful cards! I love the fun bows on the first ones, and the fabulous colouring on the florals. I love how you make those heart shakers too, with the ombre colouring! Such FABULOUS IDEAS! I love the shakers and the bows on the first ones! Love all the cards, love your coloring. Shakers look fun. Wow you have been busy and they are all fabulous! Love the cards! Your coloring is beautiful and I love the shaker cards. TFS! You've been busy making so much pretty! These are all lovely. Your floral ards are simply amazing & just stunning. Beautiful cards! I love all the different techniques and designs! The pink ribbon card is so sweet. The shaker heart cards are sweet! These are beautiful and a great variety of color and design. There is much to choose from in this new release. Wow what lovely cards! I love the second set! Oh wow wow wow wow wow! I love these! The first two are so elegant and classy, the next pair blew my mind with these beautifully coloured florals, and the last two are so nicely designed! Well done! Lots of great ideas. Thank you for sharing! Your designs are so crisp. I like the combinations of colors that you chose to use. 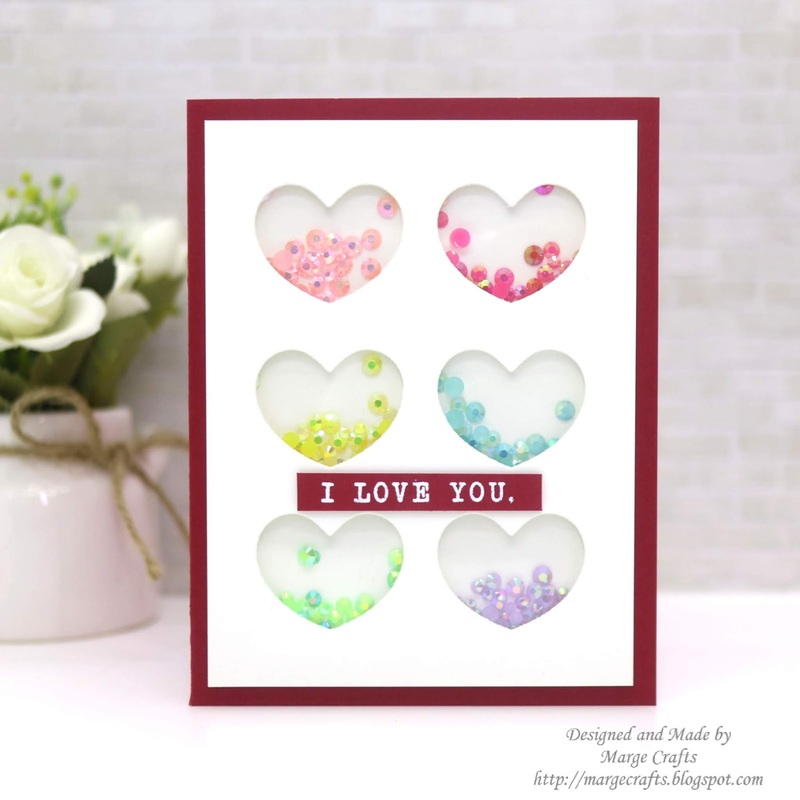 I have this tiny hearts background stamp in my cart at Simon says, nice to see some examples. what great ideas! thanks for the inspiration!! I love the multi-colored shaker card! Love what you shared ! Wow this is a very versatile release beautiful job ! Wow, beautiful collection. Love each one but especially the shakers. Thanks for sharing your designs and talent. Wow. Those Beautiful Flowers are girl and the sneakers are so fun! I love the quilted background stamp! And you watercolor skills are amazing. The flowers are beautiful! Beautiful samples! Thank you for the inspiration! I really like to the two cards with the flowers! Fantastic cards, love the floral and the shaker cards! All of your designs are wonderful, but those little shaker hearts stole the show! Thanks for sharing! Love the shaker cards! How fun! Thank you for the inspiration. Wow, you were busy! I love the bows on the first set of cards but my favs are the shaker cards!!! Really great cards! I really liked your shaker cards! Thanks for sharing! All of your cards are beautiful, but my very favorite are the pretty shaker hearts! I LOVE shakers, and your design is just the CUTEST! Love the colors and the soft look! Absolutely beautiful cards Marge! Those floral cards are just beautiful! That new 'Windows to My Heart' die is awesome! Wow Marge, your creations always inspire me! I love all of them, saw the first ones on IG and just had to come over and see the rest and to let you know what an inspiration you are to all of us! Thanks for the chance to win! 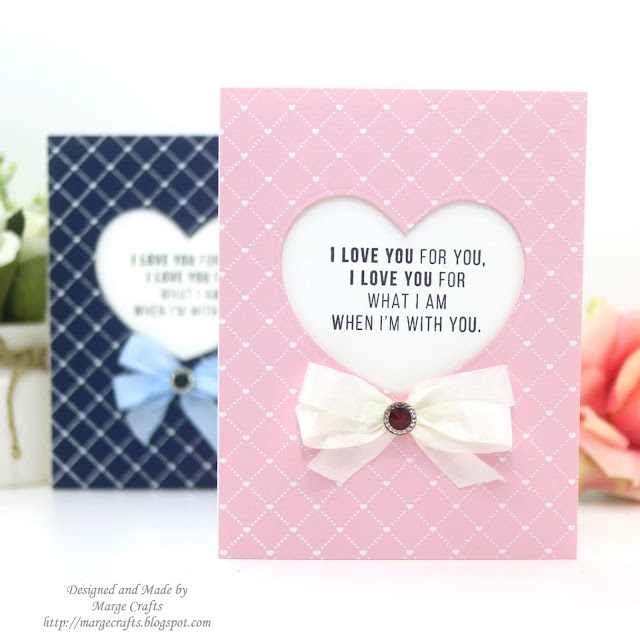 So much love on this blog post, adorable cards! What fabulous and very beautiful cards!! 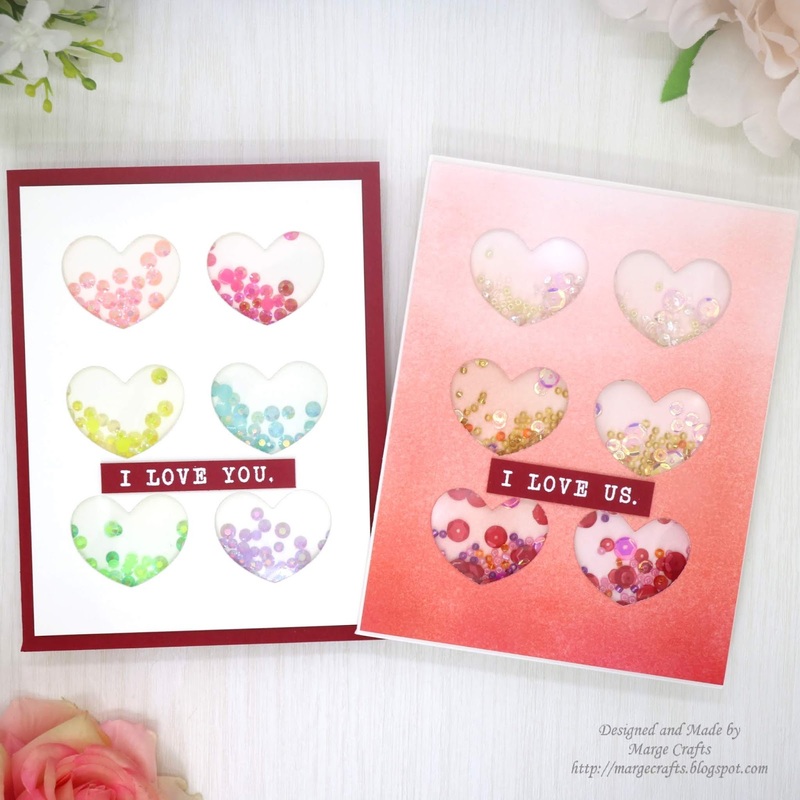 Very nice cards...love the hearts with sequins! Im such a sucker for shaker cards, and those BOWS!!! Well done, thanks for sharing! What a gorgeous lineup of cards!!! I especially loved that adorable shaker card with the hearts...so awesome!!! All of your work is extremely beautiful!!! Thank you so much for sharing..
What great cards!! The background stamp used in the first set is a new favorite. The hearts are fantastic, and think about using different colors in each is great. Wonderful creations! Awww!!! All your cards are so gorgeous!!! Love them!!! Each set is beautiful! Especially love the blue and pink set with cut out heart. Love the shaker cards, and water colors! Beautiful work, you are very talented. I especially like the shaker heart cards, such a special added feature. Great work! All great cards! Thank you for doing so many. Love them all, especially the shakers. That quilted hearts background stamp is gorgeous. Must add that to my SSS project list. It's nice to see different concepts and techniques in one place. These cards show your talent and skills. I am impressed. Great cards with beautiful colors. Thanks for sharing. You've made six utterly gorgeous cards. All are devine, those flowers you coloured look amazing. Hope you don't mind but I'm keeping this post for guidence, thank you. Flower cards are so beautiful! Beautiful and so so perfect! Fabulous cards, great release. Love all your different techniques. 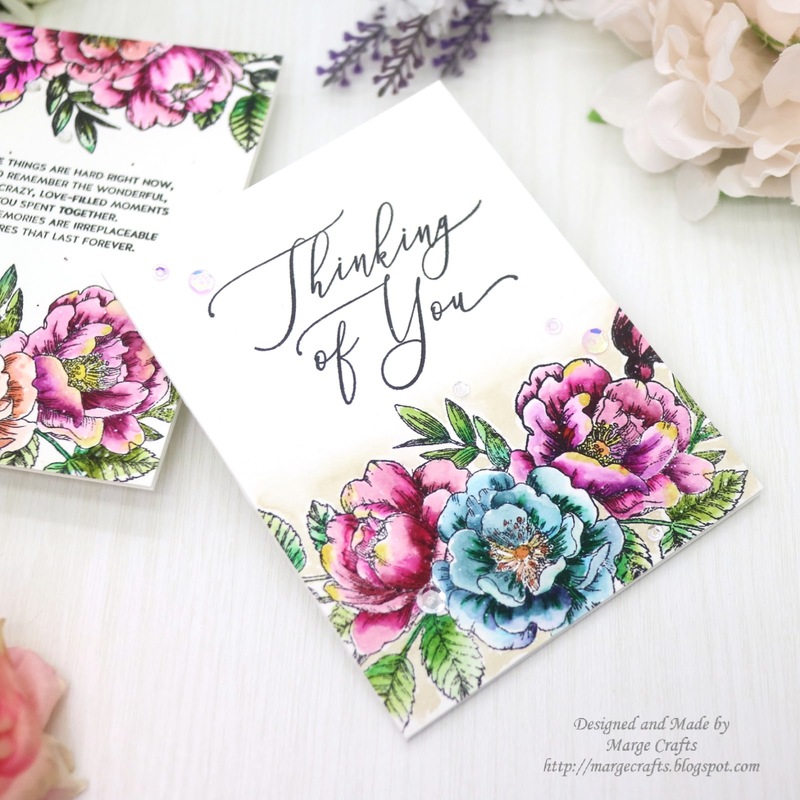 Love your "thinking of you" card. It's just beautiful. SO MANY GREAT CARDS!!! I LOVE the heart with the pillow heart background stamp, & then I saw MORE WONDERFUL CREATIONS!!! LOOOOVE the set with the Beautiful Flowers! I think this is a "classic" set & the sentiments you chose are WONDERFUL with these images!!! ;)AWESTRUCK!!! What a great assortment of cards! That little gemstone on the first one really makes the card! I love the first card. That sentiment is so wonderful. You really are an amazing artist. Love all your cards! 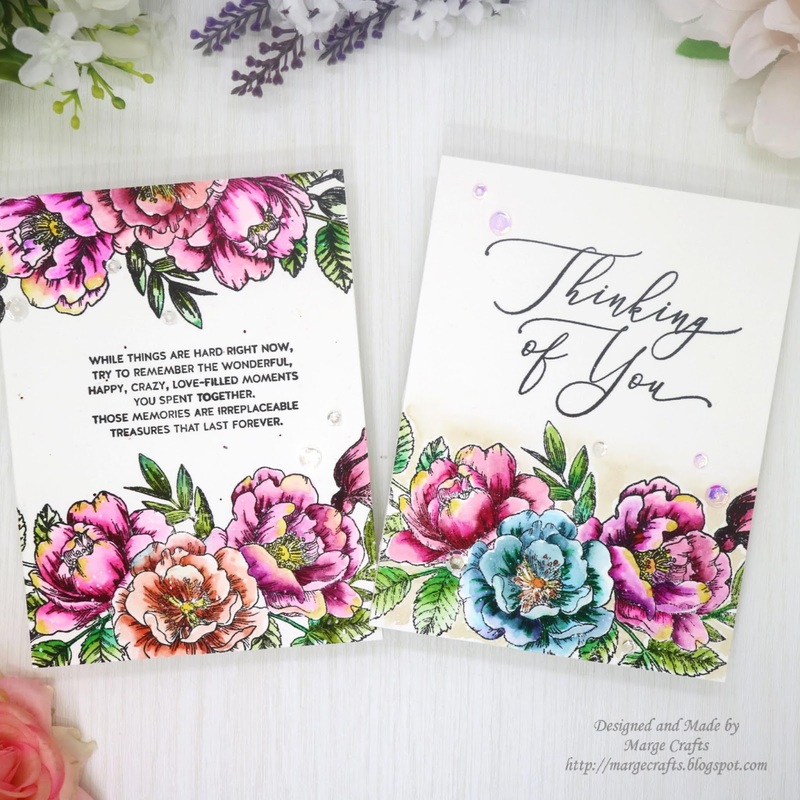 This sympathy set is so beautiful and I love how you colored the flowers. The shaker cards are so fun and colorful. Thanks for some great inspiration. I Love the shaker cards! Such a variety! You've been busy showcasing this release so very well. 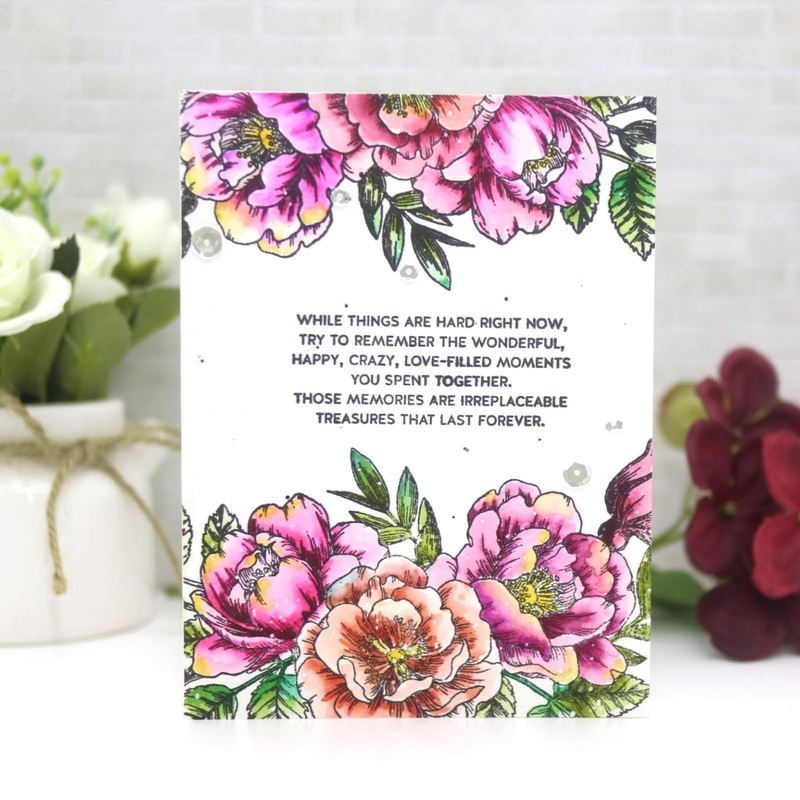 Love the sympathy card with the beautifully coloured flowers on the front & inside, not to mention that well thought out sentiment. Lovely cards Marge! You have such a wonderful assortment of cards, I love your coloring on those beautiful floral cards. Thanks for sharing with us. Love all your cards especially the one made with beautiful flowers. Awesome sentiment too. Wow! So many creative ideas! WOW!! Love your cards!! Your coloring and flowers are so lovely! Perfect card for someone you love who's sad. The navy and pink cut-out hearts are lovely. I really like your pretty bows and background with those two. Gorgeous cards!!! I envy your coloring skills on those flowers!! Pretty cards! That Moments of Grace set is just gorgeous - your colouring in is WOW!! Your card sets are so amazing; like how you show how changing of colors can change the card..1 Yes Moments of Grace sentiments are beautiful... it is on my list! All of your cards are just wonderful. I am seeing so much in this release that I love. Thank you for the inspiration! I especially like the first cards. Oh my goodness Marge, I was in awe of the first set of cards as they are SO beautiful and as I moved down I was blown away by your second set, they are absolutely STUNNING! The third set is lovely too. Oh to have that kind of talent! Very well done! What a variety of cards..I especially like the watercolored flower panels...as they remind me of spring. Great job! Very pretty variety of cards--love them all! I absolutely love your bows. Would you come to Arizona and teach me? Thank you for sharing and the opportunity to win this giveaway. Happy Valentine's Day to you! This is a great set of cards. 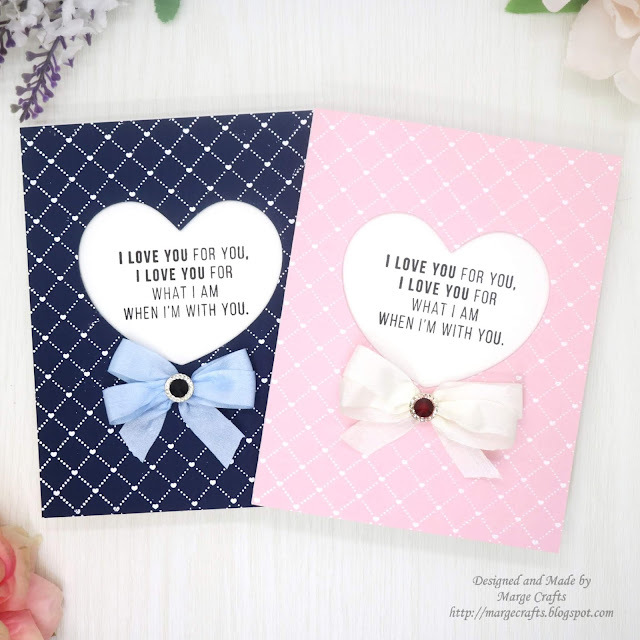 The first set with the bows has such a great sentiment and my first thought was his and hers cards because of the colors. Love the bold floral cards also. Beautiful colors. The shaker cards are so fun! I love all the hearts. What a beautiful set of cards! Love the shakers especially! What a beautiful and diverse collection of cards! Lovely! They are (ALL) Great- cant choose :-) Happy Creative New Year! Wow! All so beautiful and different. Beautiful cards, I adore the one that says, I love us! Gorgeous! Thanks for sharing and inspiring so many people. Gorgeous cards, I especially love the sweet shaker! Love all the cards. So pretty. In love with your cards, amazing and picture perfect coloring !! !Shaker cards always fancy me! Your cards left me with endless ideas popping in my head. Wow! So much creative inspiration! Thanks for sharing. All your cards are wonderful. I just love the bows. All of your cards are so nicely done! I love the first two best, I think. All of your cards are lovely. I especially like the flowers. You colored them beautifully! The Beautiful Flowers set is on my desk right now. I love how you used them. I might need that sentiment set now. Beautiful cards! Really Fabulous cards!!! I love your colorful shakers!!! So much to LOVE! I love the quilted hearts and the moments of grace are beyond gorgeous!! All your cards are gorgeous! Love the sentiments. Your watercolored flowers are just beautiful! I enjoyed all the cards you made, and the shaker hearts are so much fun. Beautiful cards! Love the floral design and your fabulous coloring! Love love love the 2 quilted heart cards!! Wow, I love all the different styles of cards you made. From the CAS first cards to the intricate coloring of the second and the fun shaker elements of the third, you have a really nice way of matching sentiment and style. Thanks for sharing with us! Great idea with the hearts. I was screaming “shaker card” to me. And it’s gorgeours. Great job. Wow, so many wonderful cards! Your flowers are gorgeous! Wow Marge, your cards blew me over. What a beauties. I love them from the first with the awesome background untill the last lovely shaker cards and inbetween the stunning coloured flowers. Thank you so much for these great inspiration and have a wonderful weekend. The shaker cards are so beautiful and fun! And I love the first two sets. Very elegant and beautiful! OH WOW!! I LOVE every card you made here!! That quilting background is a must have!! Love the shaker cards..so much fun! Also your coloring on the flowered cards is amazing...I'm so jealous!! Gorgeous cards! I adore the quilted heart background! ALL cards are beautiful, but my favorite is with the quilted hearts background stamp. They are so elegant. Thanks for sharing. Love the little hearts as shakers. 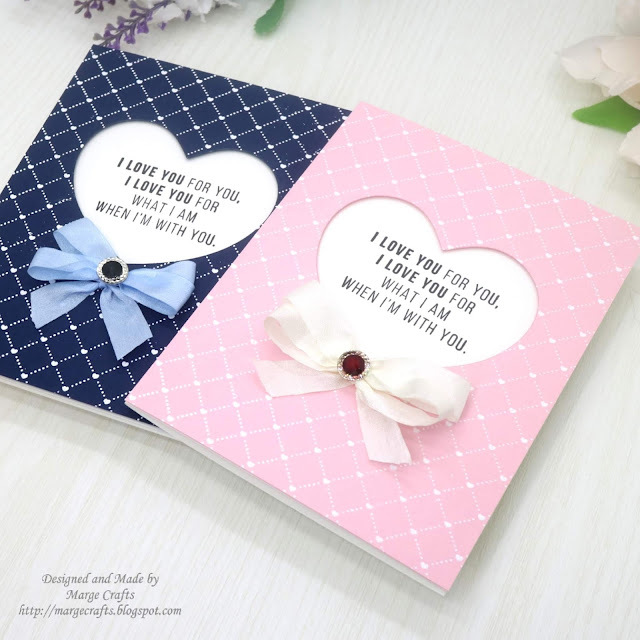 Sweet, pretty and cute cards! So pretty!! I love each one. That's a great set of cards - thanks for the inspiration! Awesome You Are Loved release! AWESOME creations! I especially love your Beautiful Flowers THINKING OF YOU card!!! I love the shaker cards and the flower cards. very very nice work!! Awesome cards!! You made so many beautiful cards! I love the way you colored the floral one! So many awesome supplies to choose from! Great Cards. The shaker cards are my favorite. Love the different ideas all the designers are using to showcase that heart die. Beautiful cards....love the quilted background cards. I really like all the different examples you showed to us. SO great and so varied. The quilted one is neat because you did a his and hers version and I dig the shaker cards too! Great ombre colors! great variety of inspiration! so much "pretty"! My favorite are the quilted heart cards. They are just so cute. Thank you for sharing your designs. You knocked it out of the park with your cards for this release! Absolutely gorgeous. Thanks for all of the inspiration! I love the background stamp on those first two cards! Such simple cards, but so stunning! And I have the flower stamp set in my "dream cart" at SSS. Such great products. Your cards are gorgeous. I love the versatility of this release. I love the diversity of your cards! Four are very heartfelt, and extremely beautiful and classy. The last two are no less loving, but they offer a bit more fun with the shaker element!! I like all of them very much!! 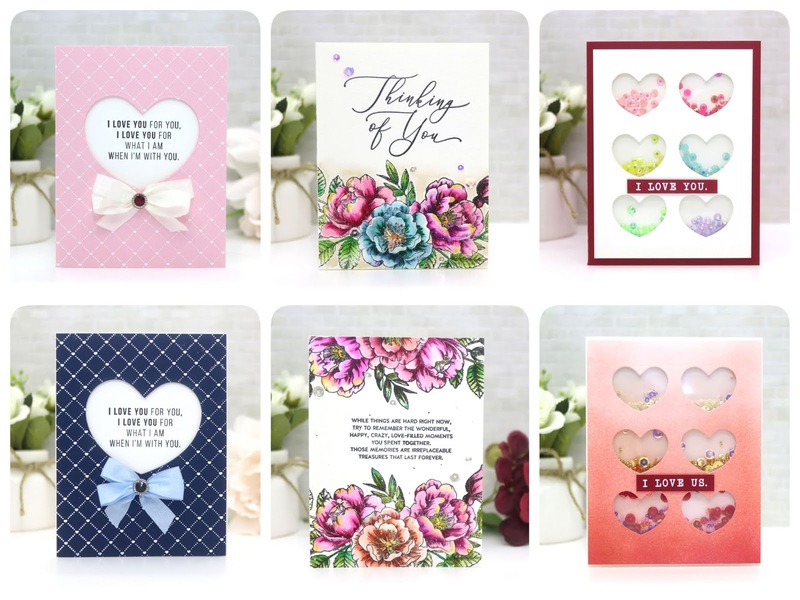 These are all great but those middle two floral cards are absolutely gorgeous! Your painted flowers are beautiful. Your cards are very beautiful and romantic! Wow, just wow! I thought those first cards were just so sweet and simple. Then I scrolled down and saw the rest of your cards. I love your flowers! Just gorgeous work. WOW! What spectacular cards, Marge! The first set of cards are so gorgeous with the center hearts, lovely bows, and gems. The quilted hearts embossing is fabulous. The second set of cards are awesome with the splendid floral arrangements. Your coloring of the flowers is great. You are a fantastic colorist, Marge. The third set of cards are beautiful with the color gradation of sequins and ink. Marge, I love all of the cards! You are a wonderfully versatile artist! Hugs! your cards are adorable and so sweet! Oh, Marge! I am doing the happy dance because I am listed as the winner of the You Are Loved Blog Hop for your site! I loved seeing your projects and can't wait to try out some of your techniques!